My awesome wife surprised me with this out of the blue. She couldn't wait until Father's day to give it to me. I eyeballed it when the OTT was announced but I didn't dare bring it up since I've been going a little tool crazy lately. I figured it was something nice to have but not a necessity. Now that I have it I can't wait to figure out all the projects I can incorporate it into. One thing that's lacking is instructions... The Woodpeckers 'manual' has a couple pages of putting it together and one page of using it as a panel cut out. I've found a bunch of the MFS tips and tricks(and supplemental manual) and I think I can apply a lot of that logic to the WP version. The kit also doesn't have the anti tip puck or the insert for making circles. I was wondering if any fellow WP variable jig owners had come up with solutions for those two? Or if the Festool accessories might work? I measured the thickness of the extrusion and it comes out right at 18mm. I have Baltic Birch 18mm scraps and I'm sure I could rig up some kind of base support with that. Just sounds kind of fiddly when used it conjunction with such a nice jig. I received mine a couple days ago but haven't had a chance to even look at it. But, I have been thinking about what I might use to support the router and was thinking of a chunk of HDPE might work. I have some in black that I could fashion a piece from, but I believe it is 3/4" not 18mm. But I haven't put a mic to it so not sure. McMaster-Carr sells it in small quantities (I think 6"x6" is the smallest) but only in imperial sizes from what I see. 18mm being .7086" it would probably be close enough or you could shave off .0414" and be spot on if you felt the need. Here's a previous thread that may be of interest. I was using mine over the weekend and had a lapse of concentration resulting in a broken 1/4” routerbit and a scar on the aluminum. Give Woodpeckers a call, they will probably sell you just the one piece to replace that length you damaged. HDPE would be great or the UMHW if it comes in 18mm. It's not like I can throw it on the planer if it's a little over. The 18mm BB just seems like a no brainer if it's the same thickness. I like simple. Looks like the MFS accessories probably won't work. I found some info stating the MFS rails are 16mm. I saw the thread in the Sales section but figured we could use a new 'how-to' thread in this section. Good thread - was thinking of starting something similar myself but I haven't had a chance to play with the VRJ yet. Thanks for pointing out Brice's MFS supplemental manual - I had completely forgotten about that! The right angle brackets also seem like a useful part of the MFS system. That should be easy enough to fabricate out of some aluminum angle I reckon, unless I'm missing something special about their dimensions. It will still work,and a reminder to me to be careful . 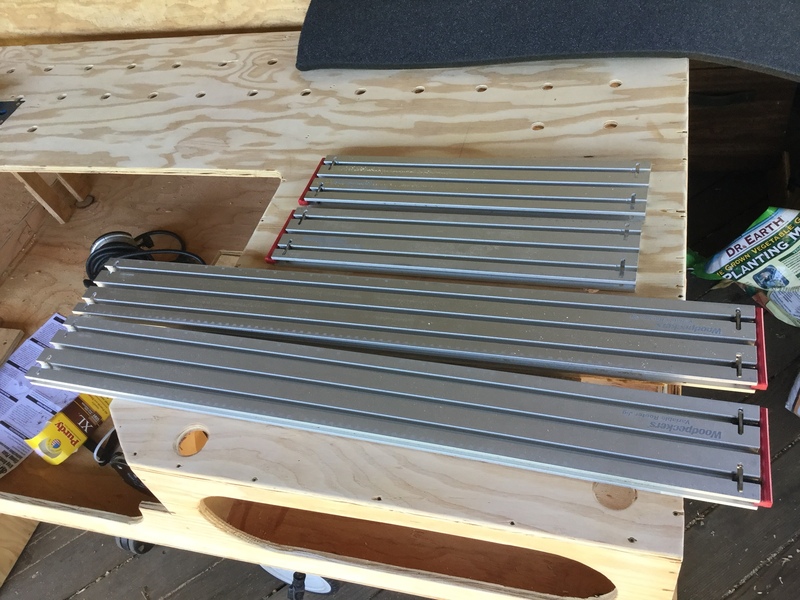 I would like to get a smaller rail,I ordered the one with 2 long rails and 2 short rails. I’ll post a pic later of the damage. 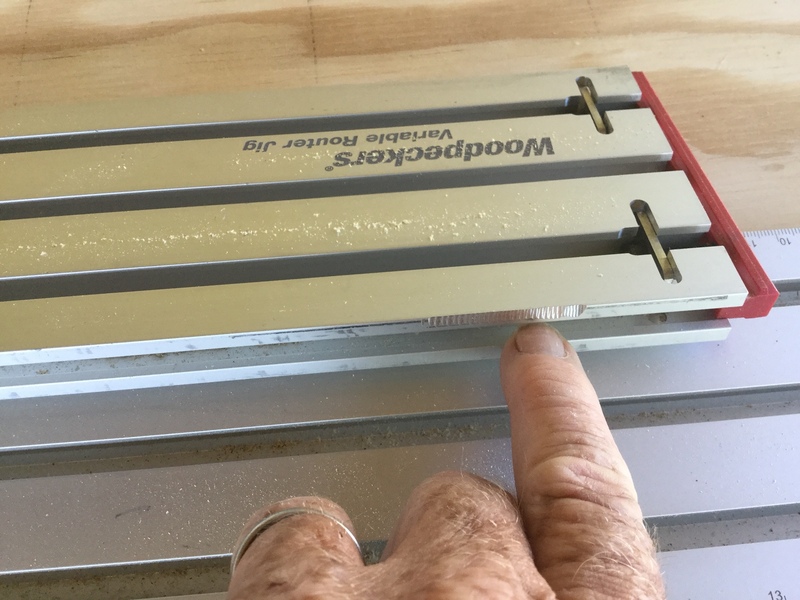 What does that have to do with using the WP variable jig? Turned a couple of birdseye maple knobs on the lathe and found a place to hang my jig. Oh, and I assembled it. You would be better off having both of those maple knobs at the same level. 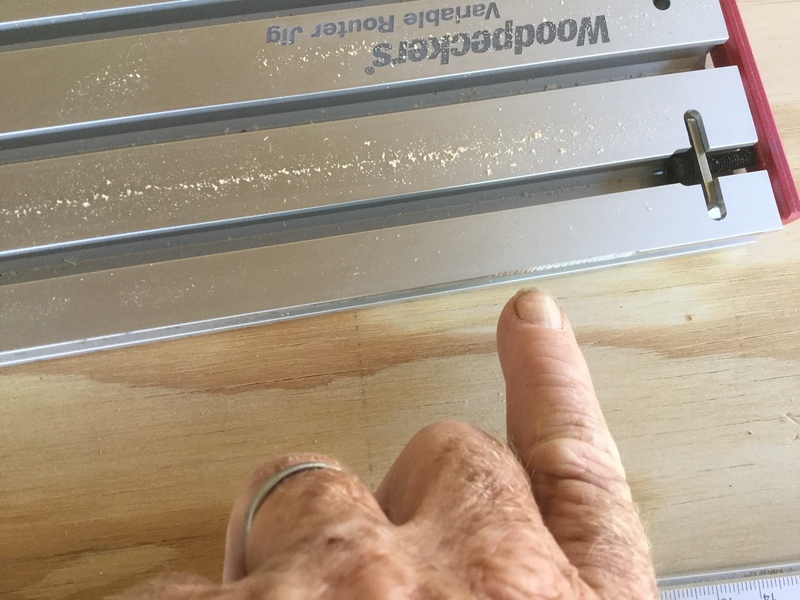 As you have it now, you need to set your router jig as you have it, but if you were to install both knobs at the same level, you could then leave the router jig at whatever setting you have used last -- thus, no need to reset your jig to the hanging position each time you put it up. I could, but then I'd need a third knob and I didn't feel like chucking another piece of maple. Or I'd need to move one knob over a stud. I just hope I get some time to use the jig. Been trying to find some project ideas. I have a bunch of maple and walnut slab off-cuts and a bunch of figured maple slabs that I've sliced down. Trying to think of a crafty Mother's day idea for my wife. Place her favorite picture in the middle, screw a piece of plexiglass on the front and call it a Variable Jig picture frame (and the knobs are now her picture frame holder). She will never find another one like it! One problem... then I couldn't use my new toy. What's y'alls preference on bearing bit vs guide bushings? I have the universal bushing adapter that came with the OF 1400 but no bushings to fit it. My hesitance on getting a bushing set it is messing around with centering the guide. But the negative on the bearing bit, as we can see from carnage above, is the potential to chunk up the jig. Especially a risk if you have a deeper plunge and need to start the bit higher. Thanks Mario. That's the way I was leaning, especially with the concern about damaging the jig. I might stop by Rockler and pickup their set. It's too bad I can't find any metric sets. Much easier to calculate offsets with Metric vs Imperial. *edit* Just ordered the Festool 30mm od template. For some reason I thought they didn't have the little snap in tabs - some of the online photos just show a flat plate. But toolnut shows one for the 1400 with the quick install tabs. Sounds easy peasy to me. Hopefully, since it's Festool made I can count on it being centered. I have been using mine with a straight bit and bushing,so far so good. Btw I bought a makita cordless router, it works great with this jig.